Happy Valentine’s Day!!! Whether you are single, dating, engaged or married, I hope this day is just wonderful! I love this holiday. Since it is a holiday of “love”, I thought it might be fun to let you all in on how me and my hubby first met. Derek and I met 7 years ago at college. It was my first semester up at Utah State University (go Aggies!!!) and his step-brother (Zach from High Heels and Grills) happened to live in the boys apartment next door to me. Seeing as his best friend at college was his brother, he was up visiting my neck of the woods pretty often. It was the week before school started when I met him for the first time. Derek, would tell you it was love at first sight for him, but I was not ready to get in a relationship in the least bit.. and the fact that he was 5 years older than me was a little intimating. He asked me out a few weeks after meeting me, but I kindly turned him down. I say kindly, but can you really “kindly” turn a guy down?! ;-) That didn’t stop him though, and THANK GOODNESS! We became great friends over my first semester, hanging out regularly. One night, we went to this event being held at the university. One of the mini-side-activities at the event was an interview with a panel of freshman girls. Derek leaned over to me and said, “I could NEVER date a Freshman girl, they are SO annoying!” I politely leaned over to him and said, “You do know I am a freshman right, and you have asked me out twice now…” We still get a good laugh about that. How he didn’t know my age at this point, I couldn’t tell you. Third time must be the charm, because he asked me out yet again (I love his persistence) and I finally said, “yes”. From that date on we were inseparable. I was not going to let that boy go for a second. He was and is the funniest person I have ever met. Don’t believe me?! Check out “Hubby Favorites 1” and “Hubby Favorites 2” for just a glimpse into what I have the privilege of having every day in my life. We dated for a year and got married in March of 2008. Our 5 year anniversary is in just three weeks and I can wait! It has seriously been 5 of the BEST years of my life. I love being married to my best friend :) We have been through so much together: graduations, buying our first home, having two of the best and cutest kids in this world (mother’s bias), coming down with a life threatening illness and after several miracles- watching him completely recover, some exciting trips and vacations and a whole lot of fun and exciting things in-between :) I know the cheese is just flooding in for this holiday, but I really am so thankful to have him in my life! Life is full of some crazy ups and downs, and I am so happy it’s him sitting next to me for the ride. Coconut will forever remind me of both of my parents. My dad’s favorite cake in the entire world is Coconut Cake and my mom looks for any excuse to throw some into a recipe. These cookies are chewy and absolutely delightful. The coconut flavor and texture is simply wonderful. This recipe comes from my grandma’s cookbook and is one I hold onto dearly. They are SO easy to make and are delicious. If you are a coconut lover, then this is the PERFECT cookie for you! This recipe is SO easy and makes the most perfect, delicious and chewy cookies! Dipping Chocolate, I use chocolate candy coating, but semi-sweet chocolate chips melted will work, too. In a large mixing bowl, combine coconut, sugar, flour and salt. Add egg whites and vanilla and mix all ingredients together until well incorporated. Drop batter by the spoonful onto a greased cookie sheet. Bake at 325 degrees F for 20-22 minutes. When cooled, drizzle (or dip) melted dipping chocolate (or melted chocolate chips) over the top. Awww I love a good cheesy love story!! 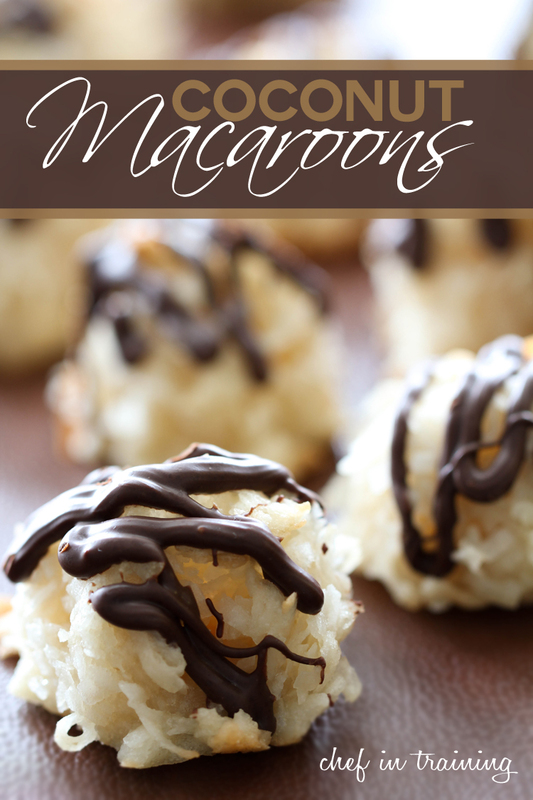 I love coconut macaroons and your recipe and cookies look perfect! Happy V-day!! cute story! and the macaroons looks great. So sweet! And the macaroons are pretty awesome too! Coconut macaroons have grown on me, these look too pretty to eat! My husband and I are celebrating 5 years in march too! loved hearing your story! What a sweet post about your early days and I love stories like this! Happy Vday to you both! Awwww sweet story!!! Good for him for being persistent =) I met my husband in college too...I love looking back on those days! So pretty and I love the chocolate on top! I love coconut macaroons! Delish Nikki! And your story is so sweet, bring on the sap, I love it! I love these!! :) Pinned for later! Wow these look great! I am pinning these for later- thanks. Hope you had a nice Valentine's Day! I made these today. My son and Almost polished them off in one sitting. Delicious!!! Same question as Marianne - how many does this recipe make please? Those look so yummy and I love your story! I wonder if I could substitute coconut or almond flour for regular flour how they would turn out. I love them but my hubby won't eat grains right now. Hmmm...may experiment tonight! Hi! These look so yummy! I have one, probably not smart question - by 5 1/3 cups of coconut do you mean 5 cups + 1/3 cup or 5x1/3 cup? I hope you do understand my confusion :-) Thanks. Re: Coconut Macaroons and German Chocolate Macaroons. Question: Should the egg whites be beaten into stiff peaks before adding to rest of ingredients? Or added unbeaten? I have the same question as Millie Harris... Are the Egg Whites beaten (stiff peaks) OR unbeaten when added to the other ingredients?? sorry for the late reply. You can lightly beat them with a fork but they still need to be liquid. Hope that helps! I don't like too sweet of cookies . So this is the best recipe I have ever had . They are so good and I love you story .Thank you . And it's healthy . do you beat the egg whites before mixing with dry ingredients? you can whisk lightly with a fork, but you still want them liquid. Hope that helps.